The three ads — extensions of the brand’s “Game of Thrones”-inspired “Dilly Dilly” campaign — were designed to have something of an episodic thread. The first ad, released during the Steelers and Texans NFL game on Christmas, features a wizard doing his stuff in a medieval court. The second, “Ye Old Pep Talk” — featuring a disastrously uninspiring speech by the king to his badly outnumbered and out-weaponed soldiers — debuted in mid-January during the NFC/AFC Championship games. 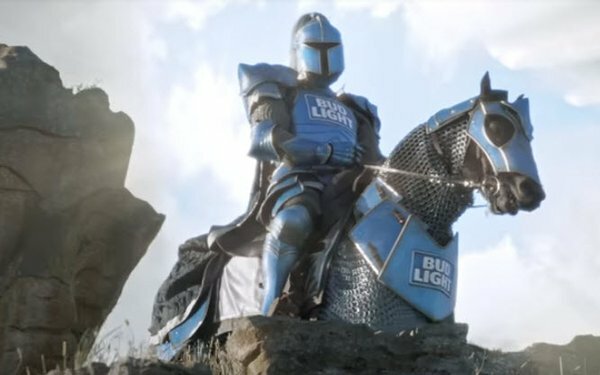 In the final ad (below), from Wieden + Kennedy, the beleaguered soldiers’ hopes are raised by the appearance of the massive "Bud Knight” — but he nearly abandons them amid his preoccupation with buying Bud Light for his friend’s birthday party. The 60-second ad, filmed in New Zealand ad directed by Jim Jenkins, will air during the second quarter, after a 30-second version of “Ye Olde Peptalk” airs in Q1.